This morning, Chinese device manufacturer ZTE announced its newest smartphone, the GEEK. 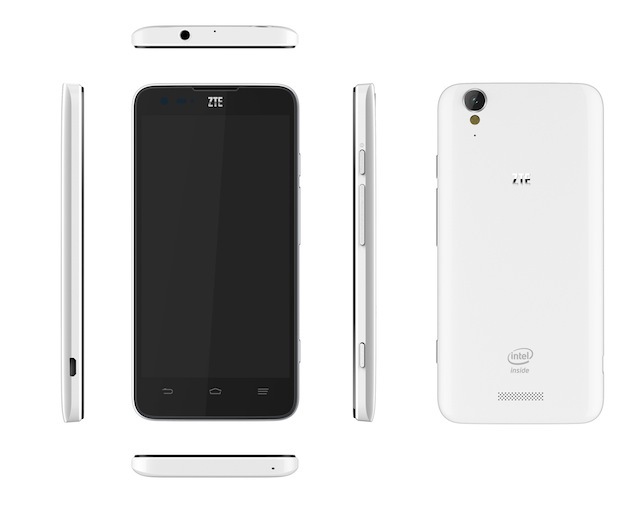 It is the first ZTE device powered by Intel’s shiny new 32nm Atom processor, known as the Z2580. It has a few decent specs, such as its 5″ 720p display, a 2,300mAh battery, Android 4.2 “Jelly Bean,” 8GB eMMC+1GBRAM, and an 8MP back shooter. The device was debuted at an Intel Developer event, so much of the focus was placed on the processor inside. The 32nm Atom, with a CPU frequency of 2.0GHz, shows that when compared to the company’s previous processor, the new chip is twice as fast for computing and up to three times as fast for graphics. To top it off, it shows less power consumption as well, which is a step in the right direction. Naturally, given that it is a ZTE phone, you probably won’t find it on any of America’s larger carriers. However, we do admire ZTE’s push to bring more high-end products to the market such as the GEEK. 10 April 2013, Shenzhen, China – ZTE (“ZTE”) (H share stock code: 0763.HK / A share stock code: 000063.SZ), a publicly-listed global provider of telecommunications equipment, network solutions and mobile devices, has debuted the ZTE GEEK, the first ZTE smartphone powered by Intel’s new 32nm Atom™ processor Z2580, at the Intel Developer Forum (IDF) in Beijing, China. The ZTE GEEK has a 5-inch HD screen with resolution of up to 1280×720. It runs on the Android 4.2 Jelly Bean OS and has 8GB eMMC+1GBRAM. It also features an 8-megapixel rear camera, 1-megapixel front camera, an LED supplement light, and a 2300mAh large-capacity battery. The phone is powered by the Intel’s new 32nm Atom™ processor Z2580, which has a CPU frequency of 2.0GHZ. Tests show that compared to Intel’s previous processor, the Clover Trail+ processor is twice as fast for computing and three times as fast for graphics. It also reduces power consumption. This year marks the seventh consecutive year for the IDF in Beijing. It is Intel’s premier event and is a major event for the communications industry. ZTE is also showcasing its V98 tablet and Grand X IN smartphone at the IDF. Both devices use Intel chips. ZTE has long emphasised the importance of user experiences. A key component of this is its longstanding partnership with Intel. When Intel first entered the mobile microchip field in 2012, ZTE released its first Intel-based smartphone, the Grand X IN, shortly thereafter. This allowed ZTE to become the first company to launch a flagship smartphone powered by an Intel processor in the European market. The Grand X IN later became become the best-selling smartphone in Austria. Over the past two years, ZTE has stepped up efforts in the smart device arena. The new Intel phone is a significant component of the company’s 2011 strategy to shift toward high-end products.